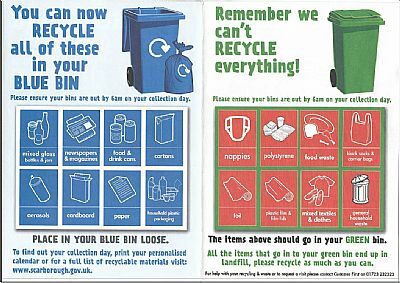 This is a reminder of what you can and cannot recycle; brown bins (garden waste) licenses will be needed again this year so please contact the Borough Council or visit their website to register for brown bin (s). 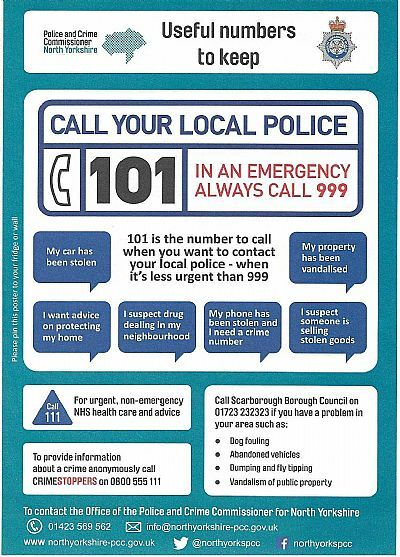 Click on the image below to see when to call the Police on 101 or 999 - you can also call Crimestoppers to make anonymous reports if you know of any crimes being committed. You can also contact the Borough Council to report dog fouling, abandoned vehicles, dumping and fly-tipping, etc. Who to call, where to get sandbags from, what to do to protect your property from water...... it's all here in this leaflet. There is now a sandbag store across from the front door of the Village Hall (Wilson's Lane) near to the first lamp-post on Derwent Green - it is fully accessible and should you notice that it is half full, please contact the Clerk and it will be refilled with filled sandbags.... thank you. To clear the path, to not clear the path - this Government information gives advice regarding snow. The only thing we do ask is that you only use provided salt from the bins on footpaths and not your own driveway please! Here are links to the Borough Council and County Council websites to enable you to report faulty Street or Road lighting (Borough Council for Street lighting and County Council for Road lighting),or to contact the Councils in general. NB - please be advised that all footway and roadway lighting should be reported to North Yorkshire County Council. The links below contain information on local Community Groups (some who have no website of their own) - where the links take you away from this website, a new page will open. Ayton Jubilee Committee - The Ayton Jubilee Committee was formed to celebrate the Queen's Diamond Jubilee, however, they are continuing in order to hold more local events, specifically Bonfire Night celebrations and a Christmas Party for our young people. The link takes you to a shared website for information on forthcoming events. Derwent Valley BRIDGE - vist their website for all news and future fundraising events. St John the Baptist Church - visit their website to see forthcoming Church events as well as news of forthcoming Services. Young persons' page - this contains information on the Youth Club. It also contains links to websites that young persons may find useful i.e. advice on bullying, childline, Miss Dorothy.com etc. Northern Villages Community and Police Group - contains information on the CaP Group and also contains copies of their minutes and verbal Police reports.